The idea of the home office has become so much more than bright white walls, gray cubicles, and plastic shelves. More and more people have the opportunity to work from home thanks to the internet and a beautiful work space can be a source of inspiration for the artist, designer or home business owner. Adding personal touches that reflect your style will allow you to feel relaxed and even more productive when working at home. You don’t need a spare room to have a home office. An unused corner in any room or spare wall space under a window can make a great place to work. Here you will find our favorite home office essentials to inspire you! We love the industrial look of this Writing Desk in warm cocoa. Be efficient and stylish with this great piece! 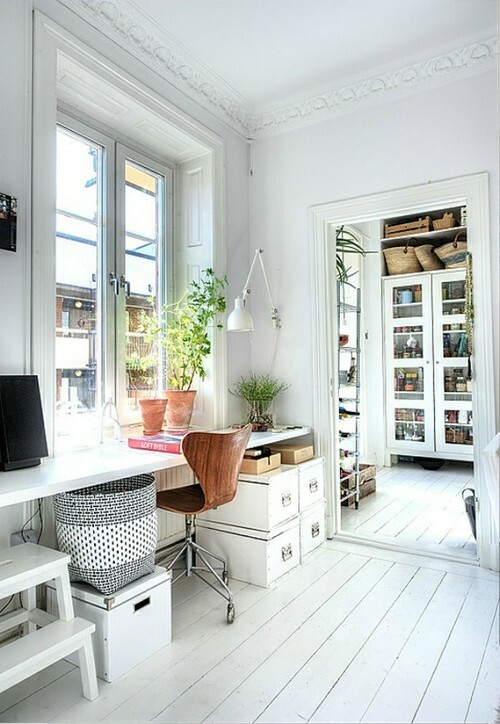 There is not always a need for big bulky desks and so writing desks are the perfect fit for a small home office space. Are you sharing an office with the hubby or maybe your little one needs a place to study close to you? Whatever the need, this desk makes it simple and stylish to work together! The Midtown collection offers a variety of options and includes built in AC outlets to make hiding cords a breeze! Who says you have to have the standard rolling desk chair? Use a fun patterned accent chair to add a unique twist and reflect your style. You can find tons of fabrics and patterns that will make your office chair a perfect fit! Lighting is an important part of your home office, giving you another opportunity to let your personal style shine through. We love the funky look to this great lamp by Uttermost! Adding accessories such as this will let your creative side flourish. For more inspiration check out our Pinterest Boards or visit us at Sheelys.com! This entry was posted in Design Tips, Home, Home Office and tagged home office, Home office ideas, home work spaces by sheelysfurniture. Bookmark the permalink.